Are you looking for a weekend getaway destination? Try Tybee Island. Featuring cool winters, Tybee Island boasts average summer highs in the upper 80s. Bring sunscreen, shades and beachwear because the island basks in more than 2,750 hours of sunshine each year. You do not have to worry about driving because virtually everything on the island is accessible on foot or by bicycle. If you leave your bike at home, you can rent one on the island. The Tybee Turtle Transit is a golf cart taxi service that also delivers takeout meals. Regardless of your budget or tastes, you will find many great places to eat on Tybee Island. Start the day off right with a hearty breakfast at the Sunrise Restaurant or the Breakfast Club where you can watch the sun ascend above the Atlantic Ocean. Amid live music, the Social Club brunch features shrimp and grits as well as other local favorites. Seafood lovers will enjoy an appetizing lunch at the Fish Camp and the Crab Shack. At the end of the day, experience the mesmerizing sunset over the western marshland while dining at CoCo’s Sunset Grille or A-J’s Dockside Restaurant. The island is home to endangered sea turtles that make their nests along the shoreline. As a result, you should only swim and play on the beach in designated areas. Avoid touching turtle eggs or disturbing a nest. Do not shine lights on the beach after dark as it distresses and confuses the turtles. Visit the Marine Science Center for more information about these marine creatures and the other aquatic animals and birds inhabiting the coastal community. While dogs are welcome in many places around the island, including several pet-friendly hotels and off-leash “bark parks,” they are not allowed on the beach. Our top recommendation for island-style Southern hospitality, the property embodies everything Tybee has to offer. Newly renovated hotel amenities include a great selection of ocean view rooms, 2 outdoor pools, easy beach access, and complimentary WiFi. Winner of South Magazine’s 2016 Best Place To Stay and Discover Tybee’s 2015 Best Place To Stay. The Beachside Colony or Mermaid Cottages – these vacation homes will allow you to live like a local. The accommodations include secluded bungalows and historic beach cottages. Many are available for weekend rentals and provide extra room to relax. While rooms fill up fast during the summer, discount rates may be available during the offseason. Head to the beach for a wide assortment of water sports like parasailing, paddle boarding and surfing. You can also swim or just relax on the warm sand. South Beach is the hub of waterfront excitement, and Savannah River Beach is popular with families. North Beach is a good place to spot dolphins as well as seagoing vessels entering and leaving the Port of Savannah. You can also take a dolphin watching cruise. 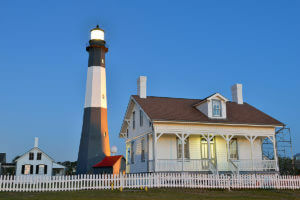 Climb the 178 steps to the top of the historic Tybee Island Lighthouse Museum. Originally built in 1732, it has survived storms and fires to aid mariners for almost 400 years. The catwalk and lamp house offer wonderful views of the surrounding sea and landscape. Tour the renovated keeper’s quarters. The Tybee Island Museum, chronicling the history of the community, is located across the parking lot in a concrete building known as Battery Garland. History buffs will enjoy visiting Fort Pulaski National Monument with its moats, drawbridges and cannons. Shortly after graduating from West Point, Robert E. Lee supervised some of the fort’s construction. You can learn about the fort’s history and the Civil War battle that took place here. Enjoy the shops and alfresco concerts of the Tybee Pier and Pavilion, a waterfront shopping, dining and entertainment destination. If the weather doesn’t cooperate, attend a movie or live performance at the historic Post Theatre. Along with Battery Garland, it is one of the few remaining buildings from Fort Screven. General George Marshall, the architect of the postwar Marshall Plan, once commanded this former military post. The Post Theatre is the heart of Tybee’s arts community. Visitors can attend one of the many cultural celebrations held throughout the year that feature food, music and a range of games and other activities. The summer season kicks off with the Beach Bum Parade the weekend before Memorial Day and ends with the Pirate Fest in October. Tybee hosts a range of other festivals as well, including the Irish Heritage Celebration, the Tybee Wine Festival and fireworks display July 4 in honor of the nation’s birthday. There are also numerous festivities during the holiday season.